One interesting thing, of course, is that unlike most of the West Side of Cleveland, which was heavily agricultural and was at one time known as “the grape capital of the country”, this specific plot of land was almost certainly never farmed at this scale before. 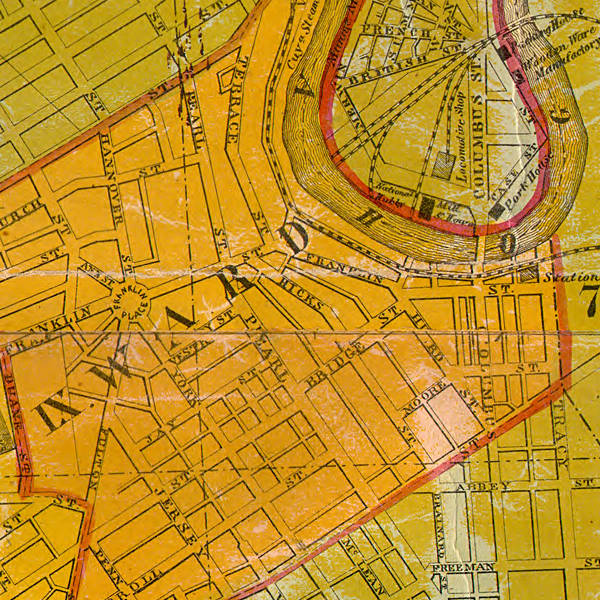 This piece of property, along what was then Pearl Road, was essentially downtown Ohio City in the earliest days of the community and then became the famous “Irishtown Bend,” a neighborhood invariably described using both the term “shanty” and the term “hovel”. After the Irish moved out, much of the land was eventually converted to industrial and warehouse use. And of course the plot itself happens to be on an extremely unstable hillside. 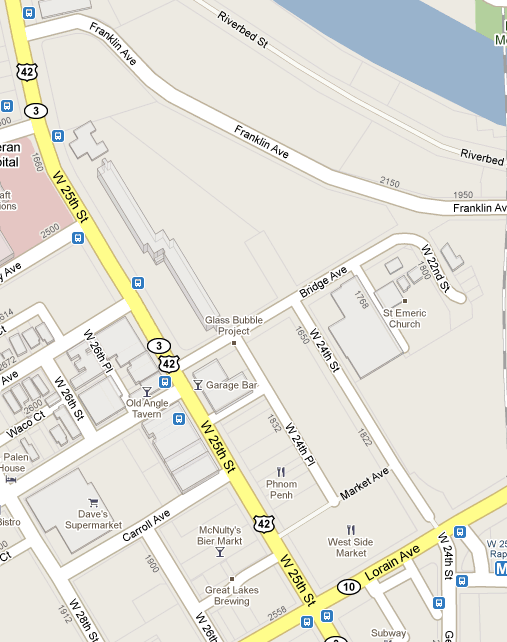 Notice that Hicks St. and two adjacent alleyways (Pearl Alley and Terrace St.) run across the middle of current Ohio City Farm space. None of those streets exist north of Bridge St. today, although all three streets (now renamed W 24th Pl., W 24th St., and W 23rd Pl.) do still run along the east side of the West Side Market south of Bridge. One thing that amazes me about the map above is all the streets and houses that would today be on a fairly steep hillside. 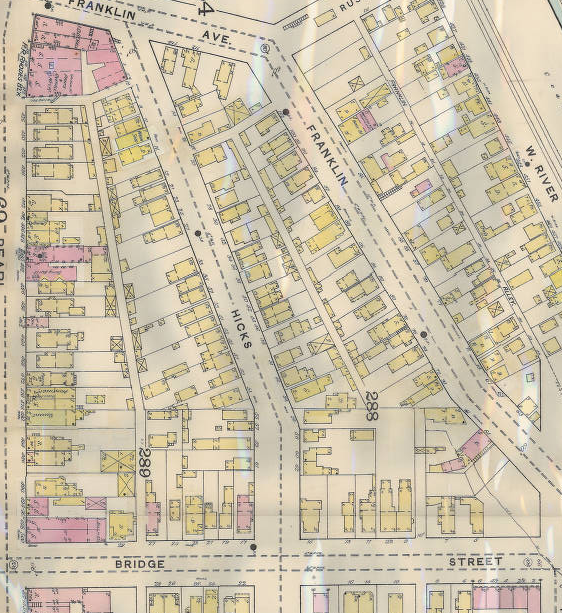 Basically Terrace St. — the alley to the east of Hicks — would be at the top of the hill today and River Bed St., a section of which you can see in the upper right corner of the 1892 map, would be at the bottom. The drop there is approximately100-110 feet. I’ll need to look into this further, but one explanation might be that the hill has eroded much further to the west now. Here’s the same space today. Almost no buildings. Very few streets. In the late 20’s the eastern end of this area had been cleared to build the viaduct that would take trains into the new Union Terminal (known as Terminal Tower today). By 1961 the forces of Urban Renewal had managed to tear down pretty much everything north of Bridge Ave and east of West 25th St. In 1963 the Riverview Terrace housing development opened. By 1999 it had become just as blighted as the shanties it replaced and the county housing authority tore down all but the high-rise part of it. So over its long history, large scale farming of this property was probably just not in the cards. Until today, when a bunch of Burmese refugees are planting fancy restaurant crops there.